Background: Randomized trials established topotecan and the combination of adriamycin, cyclophosphamide and vincristine (ACO) as second-line therapy options for small-cell lung cancer. We retrospectively evaluated the outcome of SCLC patients undergoing second-line chemotherapy. Patients and Methods: 92 consecutive patients with a diagnosis of SCLC between 2000 and 2010 were analyzed. Results: 86 patients (93.5%) were evaluable for outcome analysis. All patients diagnosed with limited disease (LD) SCLC received platinum-based chemotherapy as first-line treatment. 69 patients (98.6%) diagnosed with extensive disease (ED) SCLC received first-line palliative chemotherapy. In the total cohort, the median overall survival (OS) was 10.3 months (19.2 months and 9.2 months for LD-SCLC and ED-SCLC, respectively). 42 patients received second-line therapy (ACO in 47.6% and topotecan in 31.0% of patients, respectively). Eight patients (19.0%) were re-challenged with platinum/etoposide. Neither the overall response rate (52.9% vs. 22.2%; p=0.128) nor progression-free survival (2.4 vs. 2.4 months; p=0.794) or OS (5.5 vs. 5.0 months; p=0.997) were significantly different between ACO and topotecan. ACO-treated patients showed a trend towards a longer duration of inpatient care. Conclusion: We showed similar outcomes as reported in clinical trials. Second-line combination chemotherapy with ACO did not show superiority to intravenous topotecan, but was associated with a clinically relevant longer hospitalization time. Lung cancer remains the leading cause of cancer death worldwide. Approximately 10% to 15% of lung cancers are of small cell histology. Small cell lung cancer (SCLC) has a very aggressive course, with a median overall survival (OS) of about 12-20 months with only 6% to 12% of patients surviving for 5 years after diagnosis even in early stages of the disease[1,2]. Most patients with SCLC have a history of tobacco smoking. The traditional staging system developed by the Veteran's Administration Lung Cancer Study Group divided patients according to the extent of disease into two stages. Limited disease (LD) is confined to one hemithorax with regional lymph node metastasis and can be encompassed within a single radiation port. Approximately 60% to 70% of patients have extensive disease (ED) at initial diagnosis. SCLC is initially very sensitive to chemotherapy, with 60% to 90% of patients with LD-SCLC responding to first-line therapy, and 40% to 70% of patients achieving a complete response (CR). Response rates are lower (40% to 70%) for patients with ED-SCLC and the median OS is below one year. Patients relapsing or progressing after first-line chemotherapy have a poor prognosis. Median survival is 2 to 3 months for patients who do not receive second-line therapy. Second-line chemotherapy produces tumor responses in the range of 15% to 28%. Nevertheless, in the majority of patients, these responses tend to be short lived with a median OS which rarely exceed 6 months. Response to second-line chemotherapy is influenced by the time to progression after cessation of first-line therapy. Patients who relapse less than 3 months after first-line therapy are commonly called “resistant” and have response rates that are lower than those of patients who relapse more than 3 months after therapy, usually termed “sensitive”. The definition of a third group of patients not responding to first-line chemotherapy (“refractory” disease) is not validated since there is no evidence of a different outcome of these patients compared to the “resistant” patient group. There is no established standard second-line chemotherapy for SCLC. Several agents have shown activity in phase II trials. However, topotecan is the only approved second-line treatment option based on a randomized phase III trial that showed similar activity with topotecan to that of combination chemotherapy with adriamycin, cyclophosphamide and vincristine (ACO). With this retrospective, single-center trial we aimed to evaluate the role of second-line chemotherapy in consecutive SCLC patients treated at our institution over an eleven-year period. We identified 92 patients with SCLC diagnosed at the University Hospital of Basel between January 2000 and December 2010 through a search in the patient's database of the Department of Medical Oncology at the University Hospital Basel. Information on baseline patient and tumor characteristics, treatments, response and toxicity were retrospectively collected from the hospitals' electronic data base and from patients' medical records. The trial was approved by the Cantonal Ethics Committee (EKBB, Ethical Committee of both Cantons Basel). The last follow-up was performed on October, 1, 2014. Tumor stage at initial diagnosis was categorized according to the American Joint Committee on Cancer (AJCC) TNM staging system, 7th edition. Additionally, we categorized patients into “limited disease” (LD) and “extensive disease” (ED) as defined by the IASCL consensus conference. Overall response rate (ORR) was defined according to Response Evaluation Criteria In Solid Tumors (RECIST) criteria version 1.0 Progression-free survival (PFS) was defined as the time from start of therapy to disease progression or death, whichever occurred first. OS was defined as time from time of diagnosis to death by any cause. PFS and OS were estimated using the Kaplan-Meier method. Comparisons of outcome parameters were calculated using the log-rank test and the Mann-Whitney test. We used a significance level of p<0.05 for all tests. SPSS statistical software version 22 (IBM Corporation, New York, USA) was used for all analyses. We identified 92 patients with SCLC diagnosed between January 2000 and December 2010 at our institution. Patient demographics and baseline characteristics are detailed in Table 1. In summary, median age at initial diagnosis was 63 years (range, 39.7-81.9 years). 62 patients (67.4%) were male. 22 patients (23.9%) were initially diagnosed with LD-SCLC. In the whole cohort, the median OS was 10.3 months. At the time of data cut off 83 patients were deceased and three patients were still alive. Six patients were lost to follow-up and were therefore not included in outcome analysis. Of those alive, two patients had initially a limited disease diagnosis and one patient had ED-SCLC. Of the patients with LD-SCLC, one patient underwent combined radio-chemotherapy (RCT) and one patient underwent chemotherapy and a surgical procedure and did not relapse. The patient with ED-SCLC was treated with four cycles of carboplatin and etoposide without additional radiotherapy leading to a radiographic partial response (PR) and now has a follow-up of 74.8 months. All 22 of the patients diagnosed with LD-SCLC received platinum-based chemotherapy as first-line treatment; 16 of these patients (72.7%) received platinum-based combined RCT as first-line treatment. The median number of chemotherapy cycles was 4 (range, 1-6). Radiotherapy was generally started with the second or third cycle of chemotherapy and applied five times per week with a median total dose of 46 Gy (range, 44-60 Gy) and a median number of fractions of 29 (range, 25-31). The ORR was 95.5% with 12 (54.5%) patients achieving a CR and nine (40.9%) patients achieving a PR. Patients with LD-SCLC had a median PFS with first-line therapy of 13.8 months and a median OS of 19.2 months. ORR, PFS and OS were higher for patients receiving RCT than for those treated with chemotherapy alone (ORR: 100% vs. 83.3%, PFS: 18.9 vs. 8.8 months, OS: 23.6 vs. 13.7 months, respectively). Nine (40.9%) patients received prophylactic cranial irradiation (PCI) after the initial therapy. Patient demographics and baseline characteristics at time of initial diagnosis (n=92). Sixty-nine (98.6%) of the 70 patients diagnosed with ED-SCLC received first-line palliative chemotherapy. One patient received best supportive care without antitumoral therapy. Chemotherapy regimens used in the palliative first-line setting were cisplatin/etoposide in 51 (73.9%) patients, carboplatin/etoposide in 18 (26.1%) patients, carboplatin single-agent therapy in two (2.9%) patients, cisplatin/irinotecan in two (2.9%) patients, and carboplatin/paclitaxel in one (1.4%) patient. The median number of chemotherapy cycles was 4 (range, 1-6). The ORR was 81.4% with two (2.9%) patients achieving CR and 55 (78.6%) patients achieving PR. Patients with ED-SCLC had a median PFS with first-line therapy of 5.5 months and a median OS of 9.2 months. Seven (10.0%) patients received PCI and 11 (15.7%) of patients were treated with consolidating thoracic radiotherapy after the initial chemotherapy. Patient demographics and baseline characteristics at time of first relapse (n=68). Sixty-eight patients relapsed after first-line therapy. Patient characteristics are summarized in Table 2. Forty-four patients (64.7%) received a second-line systemic therapy after having relapsed. Twenty-four (35.3%) patients were treated with palliative radiotherapy. The most frequently used chemotherapy regimen was ACO in 20 (45.5%) patients. Thirteen (29.5%) patients received intravenous topotecan (1.5 mg/m2 daily for 5 days every 3 weeks). Eight (18.2%) patients were re-challenged with a platinum and etoposide regimen and one patient (2.3%) received docetaxel. Patients selected for re-treatment with platinum and etoposide had a median PFS after first-line chemotherapy of 8.9 months. Details of second-line chemotherapy are summarized in Table 3. Overall, response to second-line chemotherapy was limited to PR in 17 patients (47.2%) with no patients achieving CR (corresponding to an ORR of 47.2%). Median OS was significantly longer for patients treated with second-line chemotherapy compared with those who did not receive second-line chemotherapy (5.5 months vs. 2.4 months, respectively; p=0.0004). Outcome parameters for different second-line regimens (n=44). The treatment regimen (ACO vs. topotecan) did not significantly correlate to any clinical parameter (median age at diagnosis, median age at relapse, gender, staging, number of resistant patient). 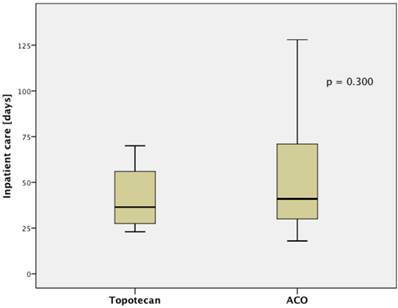 Patients treated with ACO had numerically a higher ORR than those treated with topotecan (52.9% vs. 22.2%, respectively; p=0.128). However, median PFS (2.4 month vs. 2.4 month, respectively; p=0.794; Figure 1.A) and median OS (5.5 month vs. 5.0 month, respectively; p=0.997; Figure 1.B) were not significantly different between those treated with ACO or topotecan. 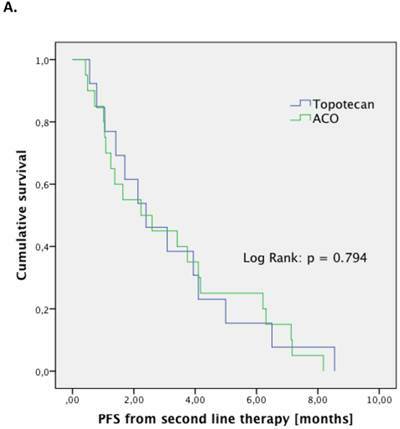 In patient care due to treatment-related toxicities was slightly longer in patients treated with ACO (41.0 days) than for topotecan-treated patients (36.5 days; Figure 2); however, this difference was not statistically significant (p=0.300). Eight patients were re-challenged with a platinum-based doublet chemotherapy. One (12.5%) of these patients had LD-SCLC at the time of diagnosis. For these eight patients that were re-treated with the first-line chemotherapy regimen, the ORR was 75%, median PFS was 4.5 months, and median OS was 12.1 months. 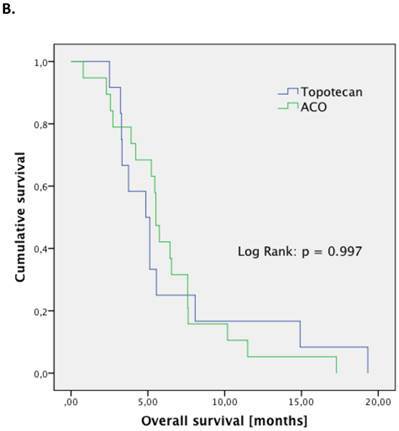 Outcome parameters for second-line patients treated with either ACO or topotecan. Kaplan-Meier plots for progression-free survival (A) and overall survival (B) show no significant difference between the two treatment regimens. Twenty-seven patients had a documented disease progression after the second-line therapy. Fifteen patients died during or after second-line therapy without radiographic documentation of another relapse. Seventeen patients (63.0%) received further palliative treatment. Table 4 summarizes the details of third-line chemotherapy. Response rates for third-, fourth- and fifth-line chemotherapy were 17.7% (n=27), 50% (n=6) and 100% (n=2), respectively. The corresponding PFS rates were 1.3 months (n=15), 5.1 months (n=2), and 3.65 months (n=1) and the median OS was 3.2 months (n=14), 10.0 months (n=2), and 3.7 months (n=1), respectively. Median inpatient care shows a trend for a longer stay in patients treated with ACO. Chemotherapy regimens used in third-line (n=27). This retrospective analysis including all patients with SCLC treated at our department between 2000 and 2011 reflects the outcome of “real world” patients. The strengths of our data set are the fact that all consecutive patients treated at our institution over the 11 year period were included in the study, minimizing potential bias. Our outcome results are in accordance to published data from prospective clinical trials[8,12] and a recently published comprehensive retrospective analysis of 448 patients in the TYROL study. Our data show that the outcomes demonstrated in clinical trials can be achieved in real world clinical practice, and both confirm the treatment quality at our institution and emphasize the role of evidence-based standard chemotherapy in unselected patients with the diagnosis of SCLC. We specifically focused on the role of second-line chemotherapy and investigated which of the commonly used regimens in this setting should be preferred. Several agents have shown activity in the second-line setting in phase II trials. However, topotecan is the only approved second-line treatment option. In a randomized phase III trial topotecan was compared to the ACO regimen. There was no significant difference in all outcome parameters (ORR, PFS, and OS). However, topotecan showed superiority in several quality of life aspects (e.g. improvement in dyspnea and anorexia) compared with ACO, whereas anemia and thrombocytopenia, but not neutropenia, were greater with topotecan. In this randomized trial topotecan was administered with a dose of 1.5 mg/m2 daily for 5 days every 3 weeks. A weekly schedule of 4 mg/m2 was tested in two phase II trials[14,15]. However, these trials showed conflicting results and there is no formal demonstration of the efficacy of the weekly topotecan schedule. In our trial all patients received the 3-weekly schedule based on the phase III trial. The outcome data in our trial are in line with those of the randomized study. The numerically higher ORR rate in our retrospective analysis may be due to lack of central radiology review. On the other hand, median OS was slightly longer in patients in the prospective trial reflecting patient selection for clinical trials. Oral topotecan (2.3 mg/m2 daily for 5 days every 3 weeks) improved OS in a randomized phase III trial versus best supportive care. The oral 3-weekly schedule showed similar efficacy compared to the 3-weekly intravenous schedule in a randomized phase III trial. Oral topotecan was not used in this cohort as it is not approved by Swiss health authorities for this indication. In sensitive patients, the re-challenge with a platinum-based doublet chemotherapy is a common treatment strategy, although there is no evidence supporting this approach from randomized trials. However, all data show that the chance of obtaining a new response is higher in patients that had previously obtained a CR and in those with a long treatment-free interval[18,19]. In our cohort 8 patients were re-challenged with a platinum-based doublet chemotherapy. The outcome of these patients is in accordance with published data. Our retrospective analysis demonstrated that in the second-line setting the combination chemotherapy with ACO did not show superiority to intravenous topotecan. However, ACO was associated with a trend towards a clinically relevant longer inpatient time due to higher toxicity. Therefore, we recommend intravenous topotecan as the preferred option for second-line chemotherapy in patients with SCLC. There is definitively a high unmet medical need in the treatment of advanced and relapsed small cell lung cancer. Despite the conduct of large clinical trials investigating new chemotherapies and targeted agents none of these drugs has ever shown to improve the outcome compared to the standard regimens discussed above. Cancer immunotherapy has recently attracted increasing attention as a viable therapeutic option, mainly in melanoma and lung cancer. In particular, recent therapeutic efforts targeting inhibitory receptors on T cells to overcome tumor-induced immune dysfunction have the potential to reshape current treatment standards in oncology. The anti-CTLA-4 antibody ipilimumab together with chemotherapy with carboplatin and paclitaxel has shown efficacy in a phase II randomized trial in ED-SCLC. The anti-PD-1 antibody pembrolizumab showed promising antitumor activity in the KEYNOTE-028 trial of patients with heavily pretreated, PD-L1-positive, extensive-stage SCLC. In the phase I/II CheckMate 032 study, another anti-PD-1 antibody (nivolumab) showed activity and durable responses as single agent and in combination with ipilimumab in patients with SCLC whose disease progressed after at least one prior therapy. However, there are many challenges in developing immunotherapeutic approaches for SCLC, including the high burden of disease and the rapid progressive disease in many patients with ED-SCLC that may not allow time to mount an appropriate immune response. Prospective randomized clinical trials have to be the gold standard for the evaluation of treatment strategies to avoid the risk of bias[23,24]. However, prospective clinical trials always reflect a selection of patients and often represent only a small part of the whole group that we have to face in our daily clinical routine. Therefore, retrospective analyses of unselected “real world” patients as the one we present here might be used to confirm the validity of results from prospective clinical trials. In conclusion, our trial shows that topotecan should be the preferred option in second-line therapy for patients with SCLC and thereby confirms the results from prospective trials. The authors would like to thank Jamie Ashman, Prism Ideas GmbH for language corrections and formatting the manuscript.